PRETTY MARYS ALL IN A ROW Now Available for Pre-order! This particular story has lived with me for a long time. It revolves around the Marys of folklore and urban legends (think Bloody Mary and Resurrection Mary), and deals both with their origins in our nightmares as well as what happens when we start to forget them. I’ve loved urban legends since I was a kid, and I’ve wanted to write about them for years, so to be able to fold that love into my work in fairy tales, horror, and dark fantasy is a bit of a dream come true. Another dream come true? The cover for the novella. Let’s take a gander at it, shall we? Seriously. That’s my cover. I don’t know how I got so lucky. After adoring the cover for my collection, I really thought there was no chance I’d love my second cover just as much, but hey, here we are, and I couldn’t be happier. Major shout-out to Gawki for their stunning artwork. I honestly can’t swoon enough. We’re in the home stretch before Pretty Marys is unleashed on readers. The tentative release date is November 28th, though that date may shift a bit as the cover is finalized with the printer. Otherwise, the novella is ready for the world. You can pre-order the book now over at the Broken Eye Books website, and you’ll also receive an advance digital copy. To say I’m elated and honored about the release of this novella is such an understatement. It’s been an incredibly fantastic process working with editor Scott Gable of Broken Eye Books. I’ve said it before, and I’ll say it again now: I am so fortunate to work with such great editors and presses. How one writer got as lucky as me, I’ll never know, but I’m thankful for it every day. As we close in on the release date, I’ll of course be sharing more updates about the novella. 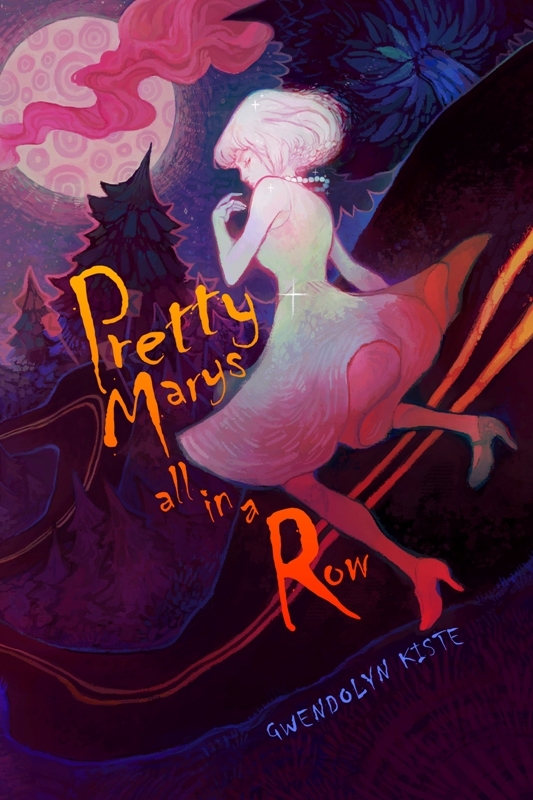 In the meantime, if you’re on Goodreads, then feel free (*nudge nudge*) to add Pretty Marys All in a Row to your bookshelf. It does a writer’s heart good. This entry was posted in Book Promotion, Fiction and tagged Broken Eye Books, Pretty Marys All in a Row on October 19, 2017 by gwendolynkiste. Welcome back! 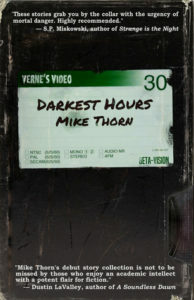 Today, I’m pleased to spotlight author Mike Thorn. 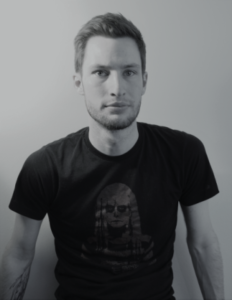 Mike is a rapidly rising star in the horror genre. 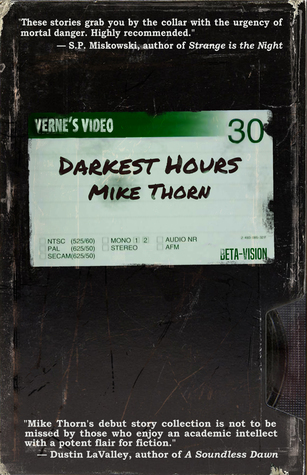 He reviews regularly at Unnerving Magazine under his column, Thorn’s Thoughts, and his debut collection, Darkest Hours, is due out in November. Recently, Mike and I discussed his genesis as an author as well as what his plans are for the future. I think I started writing stories around the age of six. I wrote my first novel when I was nine or ten — it was a long and totally unreadable rip-off of both Star Wars and Lord of the Rings. There are so, so many writers I respect and admire… but some of the people who come immediately to mind are Kathe Koja, Herman Melville, Stephen King, Virginia Woolf, Eden Robinson, Nelly Arcan, Jim Thompson, William Faulkner, Hubert Selby Jr., William Blake, Joyce Carol Oates, Robert Aickman, Flannery O’Connor, Georges Bataille, Don DeLillo, H.P. Lovecraft and Thomas Ligotti. If you asked me tomorrow, I’d probably give you a slightly different list! There are too many to name. What first drew you to horror fiction? Do you have a favorite horror film or horror story that really got you into the genre? Stephen King’s Pet Sematary was probably my first taste of adult horror fiction. As a kid, I loved reading R.L. Stine’s Goosebumps books (and actually, I’ve recently discovered that some of them hold up quite well!). I think I was interested in fantasy before I got into horror fiction — C.S. Lewis and J.R.R. Tolkien were major discoveries for me as a young reader. Some of my favorite horror filmmakers are John Carpenter, Kiyoshi Kurosawa, David Lynch, Sergio Martino, Tobe Hooper, George A. Romero, Rob Zombie, Wes Craven, Lucio Fulci, Dario Argento, Ronny Yu and Mario Bava. Congratulations on your forthcoming collection! What was the process like putting together the stories for the table of contents? Thank you so much! Congratulations likewise on And Her Smile Will Untether the Universe. I’m not exaggerating when I say that it’s one of the best debut collections I’ve ever read. It’s a stunning book. I found that building the table of contents for Darkest Hours was an interesting process in terms of trying to establish some kind of tonal shape or rhythm. When I write stories in isolation, that’s almost always how they exist in my mind — as vacuum-sealed pieces with their own individual lives and forms. But compiling this collection brought to my attention the ways in which things I’d written over the course of two years did and did not connect with one another. When I first read over the manuscript I thought, Damn, this is too relentlessly bleak — nobody is going to want to read this. So I tried to slip in some of my more satirical, less overtly brutal stories at key moments throughout the book. You write an in-depth review column at Unnerving Magazine. What inspired you to get started with reviewing, and how has reviewing shaped your own approach to writing? For a long time, I wanted to be a film critic… I started writing reviews in high school and I still write on cinema periodically. But in my post-secondary education I studied literature. I decided recently that it might be interesting to put time and attention toward writing in-depth reviews of new horror fiction. It has now kind of taken precedence over my film-related writing. As for how it shapes my own approach to writing: I don’t think it does in any conscious way. When I’m writing fiction, I’m usually zeroed in on the specifics of the stories themselves: What do the characters want? What is the conflict here? Am I using my setting effectively? Why do I have so many parenthetical phrases in this paragraph? All of that fun stuff. If forced to choose, which is your favorite part of the writing process: plotting new stories, crafting characters, or polishing an almost finished piece? Probably that final sprint — polishing off an almost finished piece. There’s something so satisfying about that last ironing out of details, when I can finally say that I’ve done everything within my power to make it the best that I can. That’s a difficult question! I’m pleased with “Fear and Grace,” which is being published for the first time in Darkest Hours. It’s not a straight genre story, but it deals with horrific incidents and situations. I wanted to represent some of the disturbing nuances of power and human hierarchies. I also wanted to write carefully about trauma and the exploitation of empathy. The story started as a simple situation: two people reconnect in a public place. Observant bystanders might sense some vague unease between these people, but for the most part the two characters’ vexed histories and inner worlds belong only to them. I asked myself, What might this encounter be like? How can I dramatize that tension between external perception and interior conflict? It’s a personal and uncomfortable piece, but I think I said what I wanted to say with it. I like something that Justin Broadrick often says about Godflesh – I’m paraphrasing, but he describes this brutal music that he makes as defensive rather than offensive. That’s what I’m usually after – not an “assault,” but an attempt to ward off the things that makes me anxious and afraid. This is something I tried very hard to accomplish with “Fear and Grace,” and I think I got as close as I can get. I just finished writing a new short story, and now I’m getting ready to dive into research for my next novel. I know it’s going to deal with that recent historical period of Satanic panic, and will also probably involve the American death metal movement that surfaced in the late ‘80s and early ‘90s. A lot of the details are still unclear to me, but I’m enjoying this total openness while it lasts. Big thanks to Mike Thorn for being part of this week’s author interview series. Find him on Facebook and Twitter as well as on his author website. This entry was posted in Fiction, Interviews on October 17, 2017 by gwendolynkiste. Welcome back to this month’s Submission Roundup! There are some very cool writing opportunities in the coming weeks, so if you’ve got a story seeking a home, then hopefully, you’ll find a place in the list below to send it! 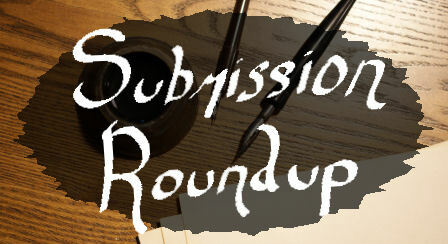 And onward now to this month’s Submission Roundup! What They Want: Open to speculative short fiction. What They Want: Open to horror-themed metafiction, poetry, and art. This month’s theme relates to Halloween. What They Want: Easily the best new publication of 2017, Fiyah is producing some of the top speculative fiction you’ll find in today’s market (Case in point: the always awesome Eden Royce’s fantastic story in Issue 2). For writers looking to submit here, the editors are seeking stories from authors from the African diaspora and the African continent. This issue’s theme is Ahistorical Blackness. What They Want: Open to speculative fiction submissions based on the theme of… wait for it… We Have Always Lived in the Castle (i.e. the all-time favorite book of this particular blogger right here). It doesn’t appear that I’ll have time to submit something, so please send in a submission of your own, will you? Do Merricat and me proud! This entry was posted in Fiction, Submission Roundup on October 12, 2017 by gwendolynkiste.